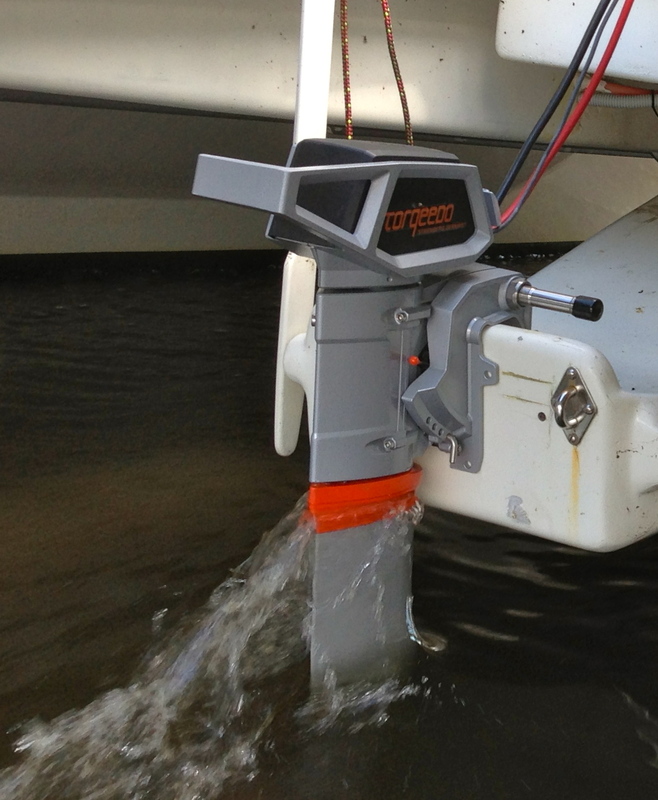 Col Campey chose a harryproa because of the many practical advantages they offer over other multihulls, and so its no surprise that he has chosen twin Cruise 4 outboards because of the practical advantages they offer over regular petrol outboards. 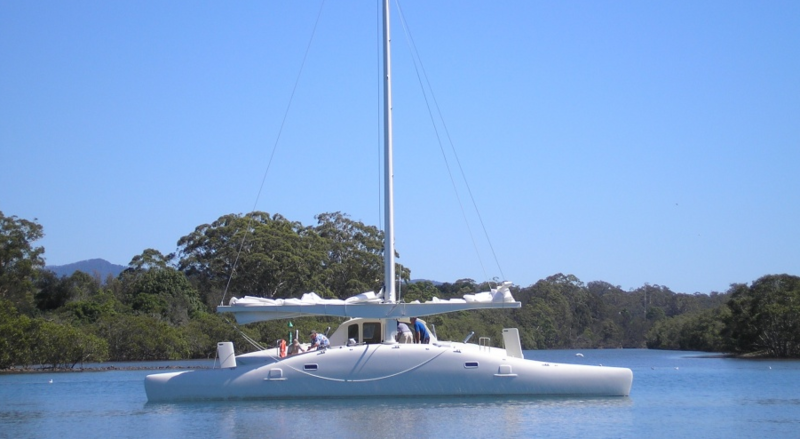 Col’s Rare Bird is a 50ft proa designed by Rob Denney and is currently lying in the Caboolture River, Queensland. I called in recently to help with bottom balancing of the CALB lithium battery pack and it gave us an opportunity to get some speed/power readings while running the batteries down to almost zero. 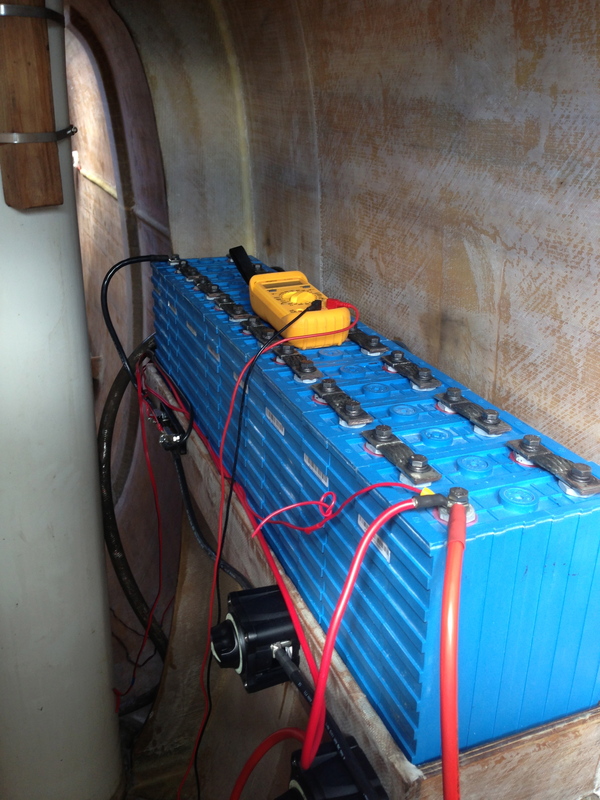 In this article I will talk about lithium batteries and bottom balancing and review the test results for this boat, and look at some elements of the electrical design for this boat. The boat itself is quite weird and its beyond the scope of this article to discuss its features and if you’re interested in finding out more about it check out Rob Denney’s site here. Lets start with some results of the speed/power tests that we did on the day. 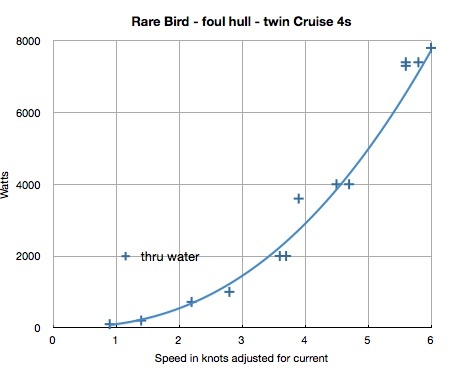 Keep in mind that Rare Bird is due for slipping to clean the hull so its not very sleek just now and so these results are the worst we would see for this boat. It will be interesting to see how much faster she goes with clean bottom. At full power on both motors she does 6 knots and its interesting to see that just by adjusting the trim we increased this from the initial tests showing 5.6 knots. This shows how important it is to get the trim right, and quite likely it can be improved even more with some fine tuning. When matched with a clean hull it will be higher still. But, you know, full power is not how these motors will be used, just as you don’t run your diesel powered boat, or your car at full power other than momentarily. More interesting is the power it needs to do around 4 knots. And we see here that 1000 watts on each motor brings her to 3.7 knots and this was before the trim was adjusted. And so I’m guessing it might take around 1500 watts total to run at 4 knots when she’s clean and well trimmed. The battery packs on Rare Bird—and more on batteries follows—are 6.5 kwH each, or 13 kwhr total energy. Assuming they would be drawn down to 20% capacity this means there is about 10400 wattHrs available, and at 1500 watts this is about 7 hours motoring. The informaton in the chart came from these observations shown in the table below. You’ll see that we did some runs upstream and downstream and we deduced there was a current of around 0.5 knots for most of our tests. The table shows an adjustment for that and you’ll see a column for speed through the water. The speed was measured using the GPS units of the Cruise 4’s. Notice that full power is less than 4000 watts and this indicates that the motors are limited by RPM and there could be a improvement in top speed by using the so called “Speed Props” which have a higher pitch. From tests on other boats we know that using the speed prop has pros and cons. The power in reverse is better with the speed prop, and on the down side, the thrust when pushing against a breeze is compromised. For reasons that are fuzzy to me, when faced with hard going with the speed prop the motors do not pull as much power as they do with the thrust props. I think its like driving a car in too high a gear—it doesn’t allow the motor to rev high enough to get the power to the props. So its a balancing act to choose the ideal prop for your boat and the conditions that are most critical. Col has chosen CALB batteries from EVPower and has manually bottom balanced them. My preference these days is to bottom balance these large prismatic LiFePo cells after noticing that they don’t actually drift. I will be removing the cell shunts from the batteries in my solar boat, when I get the time, and bottom balancing them. One of the advantages of bottom balancing is that in an emergency you can drive these packs to empty without the risk of taking individual cells to zero voltage, and thereby destroying them. With bottom balancing its also important to be very conservative in charging them, and particularly with solar charging, and so we’ll be charging them to around 3.4 volts per cell, or 54.4 for the pack. Evidence is mounting that the lithium battery failures that we are seeing are due to overcharging and probably due to failure of the charger to shutdown. So to guard against this possibility on Rare Bird we are using two lines of defense for charge protection. The first is to set the solar regulator to suitably conservative level. The second is to have a another system watching over the battery voltage that will totally disconnect the charge sources in the event of higher than normal voltage being detected. This controller of the second system is a micro BMS from EVPower which controls a latching relay which will disconnect the charge source in the event of high voltage being sensed. The voltage sensing is provided by a pair of battery meters which include relays that are switched on voltage, and in this case we break a circuit when the voltage gets too high. That will probably be set around 56 volts but we may need to do some sensitivity tests to know just where is the best setting for them. Each motor is connected to its own battery bank and the banks can be interconnected during charging when the boat is docked. We’ve chosen to isolate the banks when the motors are run because interconnection makes for quite long cable runs and we want to limit the cable length through which high currents are flowing because of the risk of high induced currents when the motors are shut down quickly. The case for bottom balancing is the subject of robust discussion in the electric vehicle community and it seems that those most strongly in favour of top balancing are those vendors who sell top balancing devices. My take on it is that top balancing has been the method used for batteries that are made up of hundreds of small cylindrical cells, such as in the Tesla electric vehicles, and such as in Torqeedo batteries. With such large numbers of cells I can see the appeal of an automated system. But when using the large prismatic cells whose voltages don’t actually drift, and are relative easy to balance manually, the use of individual cell protectors introduces another level of complexity. On Current Sunshine I had a case of one cell being at very low voltage, around 2 volts. all the other cells were up around 3.3 volts. The only reason I can see for this is a failure in the cell protector which caused it to shunt power. Luckily I noticed it during a routine check and was able to individually charge it again. But the point is that the device mean to protect the cell is the device that discharged it to a precariously low level. With manual bottom balancing there is no device to fail. Even so we have devices which control charge levels, and knowing that electrical devices can fail, we have a backup system to watch over it all. There is another advantage of manual bottom balancing and that is that by actually doing it with your own hands you get to know the batteries much better than any amount of intellectual research. And what comes with this is a degree of confidence in the system, especially useful on a cruising boat, that if something goes wrong, you will have a better understanding of system and a better chance of fixing it. So far I didn’t have the opportunity to sail with Col on his, indeed, Rare Bird. I look forward to doing that and will bring an update when the installation has been used more extensively, and has a slippery hull. Lithium batteries, proa, solar boat, Torqeedo Cruise 4. Bookmark. what kind of prop did you use? on a catamaran. Especially at low watts. Yes the prop is the V19 that is standard now. I did not realise the V30 is especially good at low watts. In some results on other catamarans we found that the V30 is not as good in high loadings, such going against the wind. The motors would max out at around 3000 watts each and not be able to get to full power. By going back to the V8 the motors can reach their potential power and the boat makes better speed. I don’t have result comparing with the v19. So for usability in adverse conditions we prefer the original prop which is good for thrust. Some still prefer the V30 because it is so much better in reverse.